Keeping your overhead door system in good working order is crucial if you want to prevent a lot of accidents from occurring. There are a lot of different parts of your garage door that can greatly benefit from regular maintenance, and our technicians can make sure that every single one of them is properly cared for on a regular basis. You either have extension or torsion garage door springs. The former can't really be maintained more than simply checking their condition and replacing them in a timely fashion. As for the latter, though, there is a lot that can be done to extend their longevity. Regular torsion spring lubrication and adjustment will go a great deal towards keeping these components in great shape and reducing the wear and tear they go through on a daily basis. Since adjusting torsion springs can be dangerous, it's best left to our expert technicians. These are the components that are in charge of guiding the movement of the overhead door panels. If your garage door got off track it was probably due to bending of these components and/or wearing of the rollers. Even subtle dents can cause these wheels to slip out and force the entire door out of alignment. As part of our maintenance service, our technicians examine these important components and repair any dents or bending they discover. We even replace steel rollers that have become too worn to serve their purpose, and lubricate ones that may be starting to squeak a little. This will help ensure the smooth movement of your door during its opening and closing. Your garage door opener also needs to be regularly serviced to stay fully operational. Our experts will check its inner circuitry and motor to ensure both the circuit board and the main gear are in great shape. Then we'll test the photoelectric sensors and make sure the door reverses when these crucial components detect something is blocking its way. Don't wait for things to go wrong in the future. 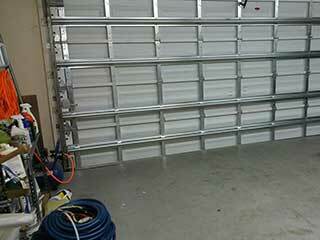 Contact Garage Door Repair Shelton today and let our technicians make sure your system is in the best shape possible.